The wrestling captain’s rock hard poses give a sneak peak of their rock hard stance on the mat. Photo by Lindsey Nguyen. Placing fourth in the California Interscholastic Federation, winning their seven-time League Championship and placing first at the Beach Bash tournament,0 are only a few of the many accomplishments Fountain Valley High School’s wrestling team has had this season. “Our main goal (was) win our seven time League Championship, to win CIF, and to qualify for Masters,” said senior captain Trenton Ching. And complete their goals, they did. At CIF, Ching and freshman Max Wilner placed in both championships, senior Jacob Taub placed fifth, junior Nico Damschen placed sixth and freshman Dylan Zotea placed third. Four other wrestlers qualified for Masters, and Wilner placed second in State. Overall, the team made some major improvements from last season, going from twelfth to fourth at tough tournaments like CIF, and having more qualifiers in both Masters and CIF. Though they garnered success, the team had to overcome many obstacles this year, such as injuries to key wrestlers like junior Jack O’Donnell, who was injured at their first tournament and was unable to wrestle for the rest of the season. Some teammates from Calvary Chapel also lost when they transferred to Edison High School. “I think Edison was our biggest obstacle, but we came out with the win on that,” said senior captain Christian Hernandez. For the team to improve, the captains agree that they need teamwork and put more focus on their goals. While they may be great at winning matches and securing pins, they need to work on being able to be there for the team, and not getting to distracted, which could lead to an even stronger team. Although Ching will be graduating this year, his goals for the team next season is to win their eighth League Championship and CIF. 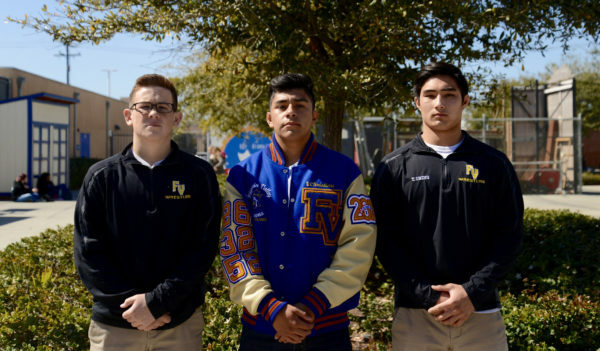 “I think it’s just going to keep on growing and just get better- because of the feeder program we have a lot of good kids that are going to be coming in, and Fountain Valley’s wrestling team has always been known to work hard and perform,” said junior captain Jack O’Donnell.